What color is the countertop ? The granite looks like my Pocono Green countertops. Color of paint on island cabinets? From Kell above: This is American Cherry hardwood and it has a clear poly on it. 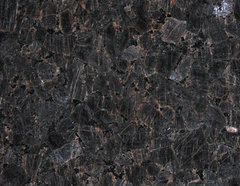 granite island top - what color is the granite on the island? my question was/is what color is the granite? Love the schoolhouse pendant lights. Would you share where you got them? 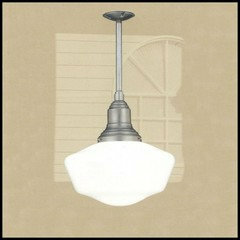 - I am re-doing my kitchen, and would like lights like these over my new island. Thanks for info! standard height between the top of stove &bottom of microwave? The National Kitchen and Bath Association (NKBA) publishes its own recommendations, alongside those of the IRC. The NKBA suggests a clearance of 24 inches between stove top and microwave oven. Experienced residential building inspectors in your area can also offer guidance. The manual that accompanies your microwave oven may specify a clearance figure. Commonly, manufacturers recommend a minimum distance of 30 inches. Some manufacturers may distinguish between gas and electric stove tops, relative to clearance. The figure for a gas stove -- which involves open flames -- may be higher than that for an electric stove. You might want to take a look at "Forest Floor" by Benjamin Moore color #1498. Another option is "Trailing Vines" by Benjamin Moore color #1505. What is the color of the island? Who is the manufacturer of the cabinets? These are custom cabinets, built by a cabinet maker in his shop and then installed on site. Cabinets - What type of wood was used in these cabinets? They are beautiful. Please, could you tell me what kind of tile, size and accent tiles are used here? We chose tiles by Walker Zanger, ceramic glazed tiles, Ceramic Alahambra Classic line (pages 80-84 from their online catalogue). The Owners had a few decorative tiles from Guatamala that were to be integrated in to the project and the WZ tiles meld beautifully with that style. We used 2X2 accent tiles and 4X4 tiles for the majority of the field. "Staggered pattern" made them work together well. What color did you paint your kitchen walls? Looks awesome! Benjamin Moore's Almond Bisque is a similar color. What color stain are the cabinents? This is American Cherry hardwood and it has a clear poly on it. What type of granite is on the island? Very pretty - here are a few suggestions. 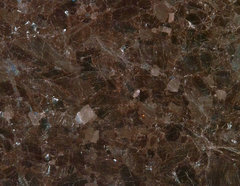 But remember, that often times granite it called by different names region to region and supplier to supplier. Island - Can you please tell me the dimensions of the island? Love the counter chairs. Where are they from? How big is they kitchen? An how long is they island? - How big is they kitchen an how long is they island. What kind of microwave (strong venting system) did you pick? - I have a space issue; and therefore must vent from the microwave. Currently have a micro with fan only and not vented. Need STRONG vent system. Would like recommendations - are the micro / vent systems always integral or can/should you buy them separate? 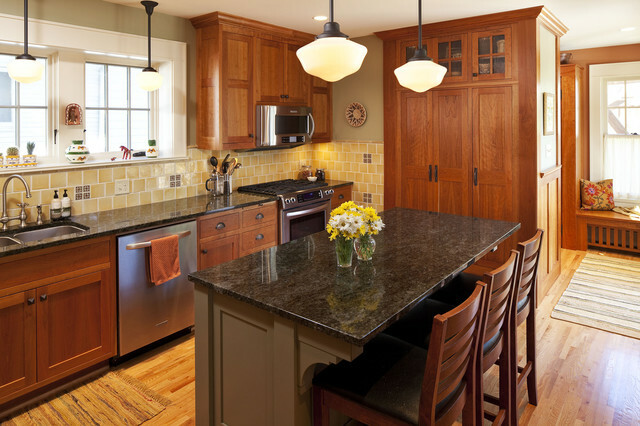 What is the color of the island granite? lovely kitchen. what type of granite did you use? Are you pleased with the Kitchenaid range? - This was my favorite when shopping and then read many negative reviews. Would love to hear your opinion. Size of island? Thank you! Very impressive! Could you please tell me the dimensions of the kitchen are and the island? Thank you! What manufacturer supplied the wood corbels? What are your tiles? They are perfect with the floors! To gauge where your pantry will fit best for the chicken test, first figure out the arrangement of your work zones — particularly the areas around the fridge, sink, oven and cooktop.